If you read my How I Lost 20lbs Without Really Trying post, not required reading at this time but please do go check it out if you haven’t, you’d have caught a glimpse of when I decided to run a marathon and how my attitude switched over the 10 months of training I did in preparation for it. It was the hours spent alone on the road, mentally pushing myself slightly farther out on the diving board each time, til I looked back and realized how far I’d out come from the ladder. Just like putting that few percent of your pay into your 401k or the government taxing you “just a little more,” you don’t feel the gradual change, because you’re “only” running 1 more mile further than last week. 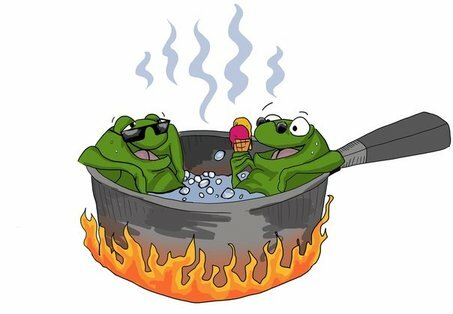 There’s a famous saying about boiling a frog, why you’d want to I don’t know, but if you throw a frog in boiling water, he’ll jump right out because it’s too hot. 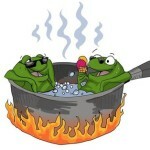 However, if you put him in room temperature water and keep turning up the heat slightly, he’ll never notice the change and finally be cooked. That story is almost always used in a negative connotation, but it works both ways, fortunately. By the time you look at your plan and realize “Dang, I’m doing 20 miles tomorrow?” it’s too late because you just did 18 miles two weeks before, and it’s “only” 2 more miles. That’s how running and training works, it gradually talks the body and mind into doing something that it previously thought impossible, when in reality you probably could have done it long ago. Your world shrinks, you no longer get mad when you have to park ALL THE WAY in the back of the parking lot at the mall, when you used to circle the same 4 aisles for 10 minutes hoping to get a spot up front. I look back now and realize that even in the first month, I could have already propelled my body 26.2 miles but at the time that seemed like a crazy long distance, it may as well have been 262 miles, they were both long ways. I would have been slow, I’d have had to have walked a lot of it, but I could have finished it, way back in month 1, my brain just wasn’t convinced, it told me otherwise. 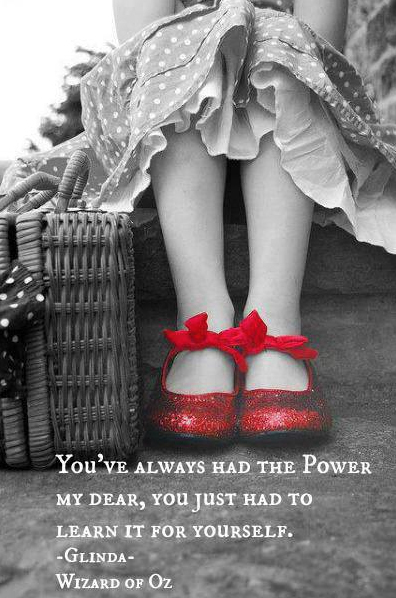 Remember at the end of the Wizard of Oz how Glinda tells Dorothy that she always had the power to go back to Kansas, you were probably thinking “WHAT?! Why didn’t you tell me this way back in Munchkinland?” The Scarecrow asks “why didn’t you tell her?” Glinda’s reply “because she wouldn’t have believed me, she had to learn it for herself.” How ticked will you be later on at opportunities you were too afraid to take, ideas you were afraid to risk failing at that someone else has since done? As mad you would have been at Glinda? What is it in your life that you think is too hard for you to do but humans have already done before? I’m not asking you to flap your arms and fly but what is your “marathon?” Think you can’t climb Mt Kilimanjaro, wrong, my friend Dan Hernandez just did it 2 years ago and blogged about it here. Think you can’t come back from financial ruin and be successful and live a good life, wrong, my friend Amanda Tinney declared bankruptcy, lost it all, and then built a website that she sold just 2 years later for $36k, and now she spends her days in Disney blogging about it and hasn’t had a “job” since. Are these miracles? No. Is there some good luck that comes and helps sometimes? Absolutely. Has luck ever come and knocked on someone’s door and said ‘hey, here’s some money, oh by the way, you can run an 8 minute mile and finish a marathon without getting hurt.” Absolutely not. Until you make the decision to get up off the couch and try something, that’s all you’ll ever be, a couch potato. 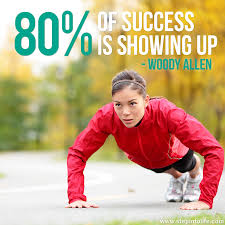 Just like the Woody Allen quote “Eighty percent of success is showing up,” you’ll never succeed sitting on your tail. No one ever finished a marathon, started a successful business, or climbed a mountain reading about it online. Tell me what your “marathon” is, or what mountain you’ve already climbed that gave you confidence to do more, you may inspire someone else here. Success breed success, pass it along. I see on your blog you’re doing the Dopey in January. I’ll be there, I did Goofy last year but this year I’m “only” doing the marathon, sounds silly to say that now… Good luck! Love this post! 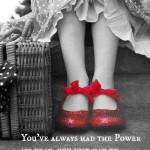 & the whole Wizard of Oz reference, brilliant:) My current “marathon” is figuring out what my next “marathon” should be. I’ve been a part time nanny and stay at home mom for 10 years now and I’m ready for a new adventure. I’m still sticking with my current job, but I’m ready to add something else. Not sure what that is yet, but I’m working on it. Wow, sounds like you have a whole world of options. You have to overcome the feeling of “OMG, too many options” and think about what it is you really want to be doing. If you check out the book in my Confession: I Have a Debilitating Illness post, The War of Art by Steven Pressfield, he talks about thinking of what you would do if you were told you had 6 months to live. What things would no longer be important and what would suddenly become important?